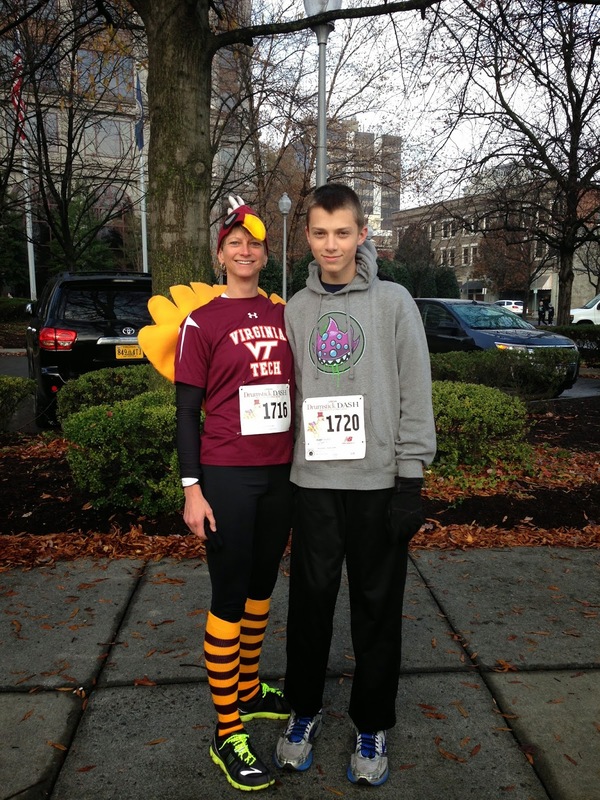 On Thanksgiving morning, Grant and I did the Drumstick Dash 5K in Roanoke, VA. 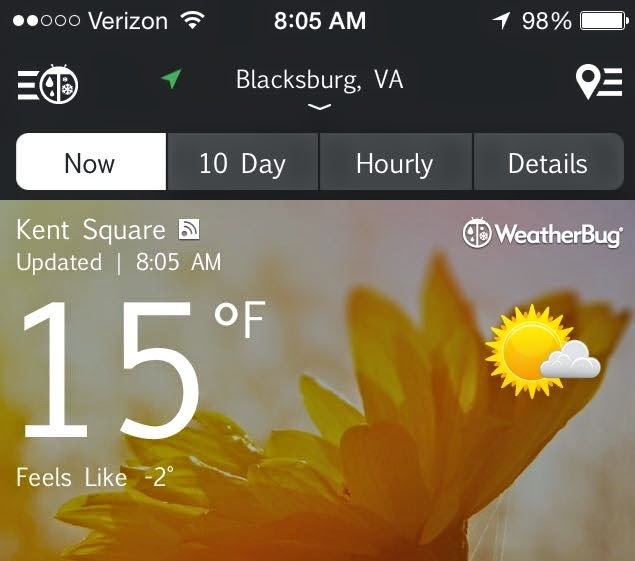 It was our first year at home in Virginia for the holiday, so this was a new race for us. I was surprised when my 12-year-old Grant (yes, I am aware he is tall) agreed to go with me and I was further surprised that it was no problem to wake him up at 7 am on a non-school day! 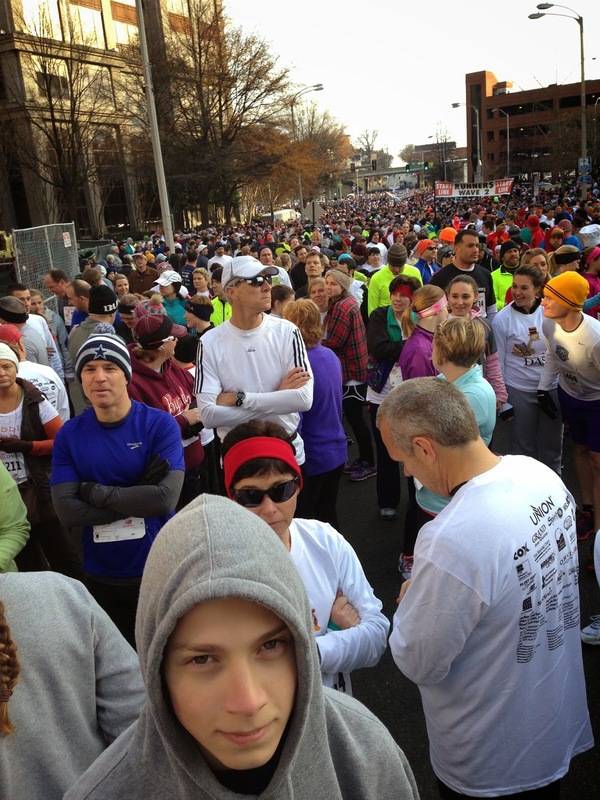 This event drew 13,000 participants and raised money for the Roanoke Rescue Mission. It amazes me that this race in our small neighboring city is bigger than the Pittsburgh Turkey Trot that I've raced the last few years. 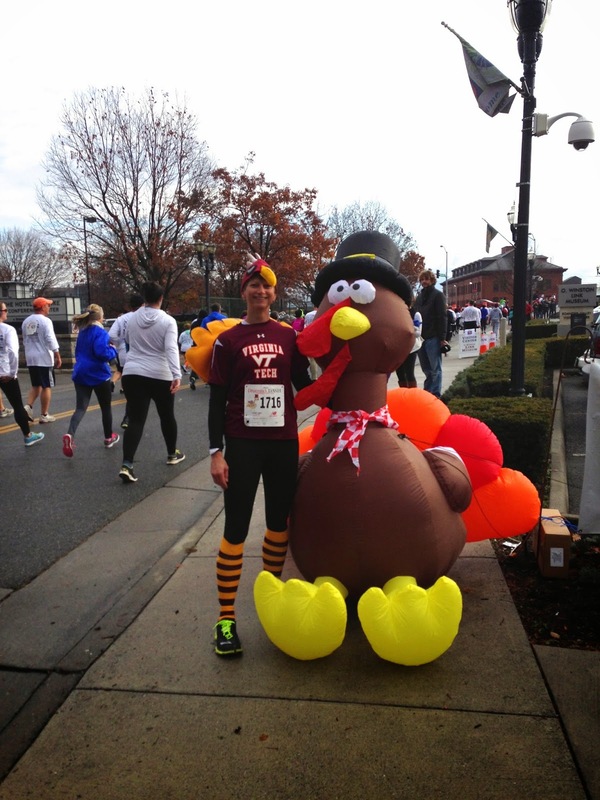 Incidentally, in 2013, 870,000 people joined in Thanksgiving Day races, running 3.4 million miles (source: Turkey Trots by the Numbers, Competitor Running)! Grant and I contributed 6.2 miles to the 2014 tally. Grant was looking a little less enthusiastic at the race start. I got a little choked up at the start of the race as I thought about sharing this beautiful morning with my son, thinking about the 300+ families that spent the night at the Rescue Mission, and feeling thankful for so much. We lined up in the middle of the crowded pack. Grant was ready to sprint with his soccer goalie fast reflexes, then at the sound of the starter's pistol we took off at a...walk! He said "well that was rather anticlimactic!" While I would love for this to be a seed that grows into a future love of running for him, there were no expectations, just the moment we were in. Confession time. 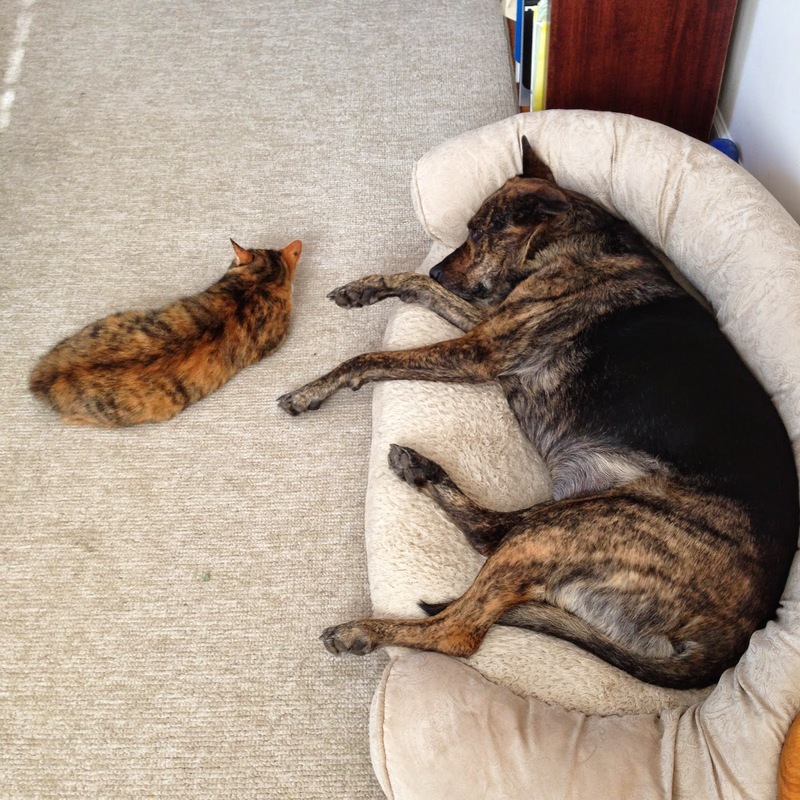 I had to work to control my hard-wired competitive and need-for-speed tendencies. It is hard to resist pouring it all out and sprinting through the finish. But resist, I did, and we finished side-by-side. My self restraint paid off. 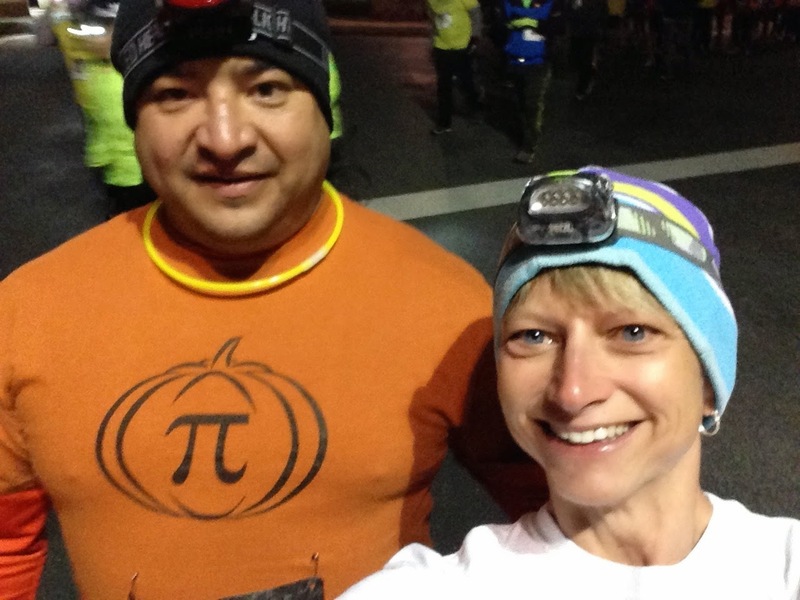 After the race, Grant said, "I'm not ruling out doing another one." 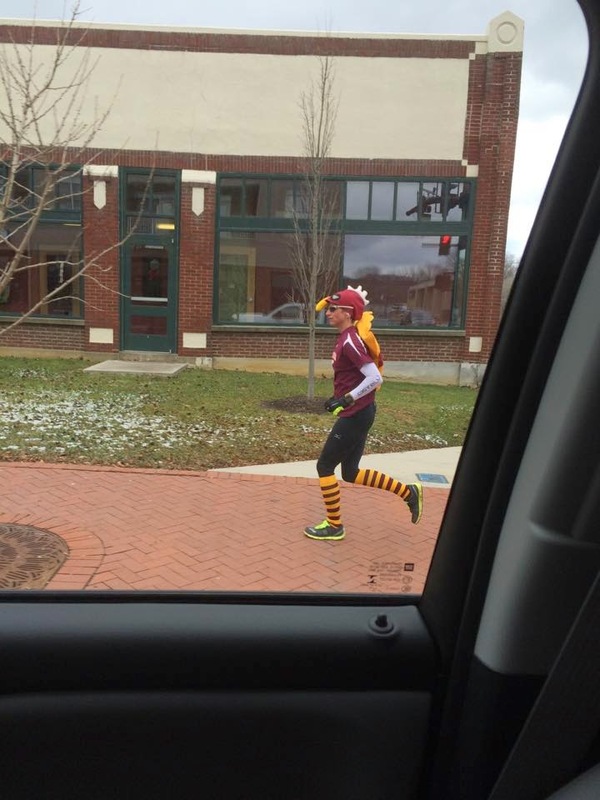 With plenty of energy remaining, I went home and ran another 7.5 miles around town in my turkey suit. I got a lot of thumbs-up from motorists, I passed some guy on the sidewalk who laughed his head off, and the customers in Waffle House waved. I had a good time! 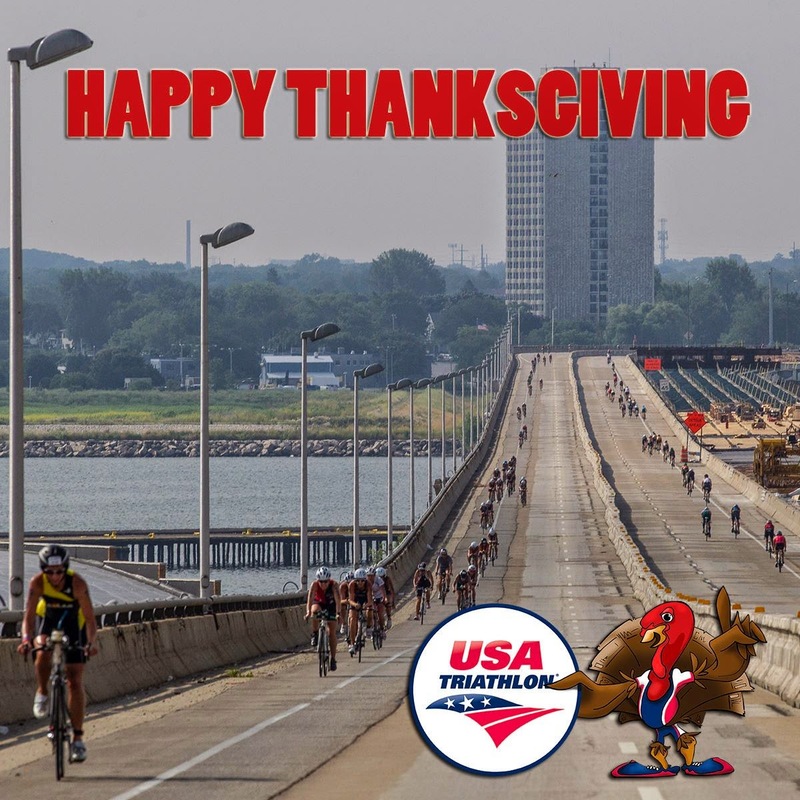 I made USAT's Thanksgiving photo this year. That's me in the bottom left in my Solar Connexion kit! 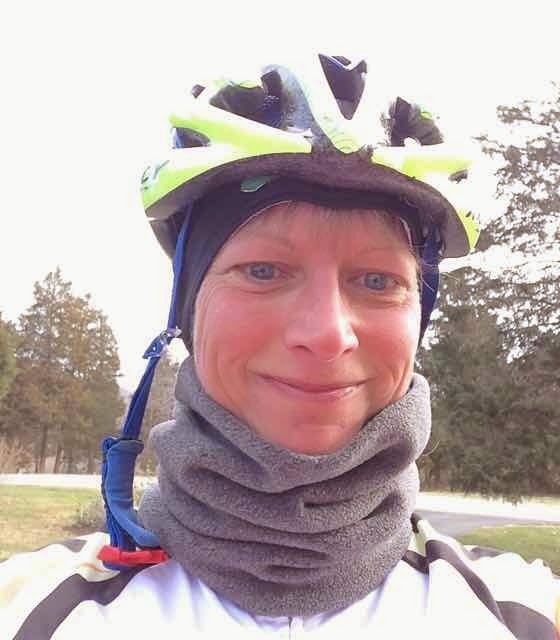 I continue to enjoy unstructured training. With several trips on the calendar for November/December, some extra family things going on, weather uncertainties, and the holidays, it's been really nice to have flexibility there. 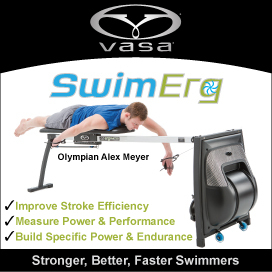 I took most of November off of swimming but got back on the Vasa Swim Ergometer. I'm back at the gym, and doing essentially one training-type thing per day with one day off per week. Nothing too notable aside from a random 15-mile run I did yesterday, just to know I could do it. I rode up with fellow crazy people Lynne, Carmel, Anne, Jessie (and TJ who took the photo below where we all look really warm and all our black pants look oddly grey). ...and I met up with other fellow crazy people including such notables as Nancy (top photo, left), for whom a 10-mile race that morning was apparently not enough for the day, Karen (top photo, in orange) who finds time as a 4th year medical student for her cute "little hobby" of Ironman racing including IMCHOO a few weeks ago, and Ron who has been known to sign up for (and race!) 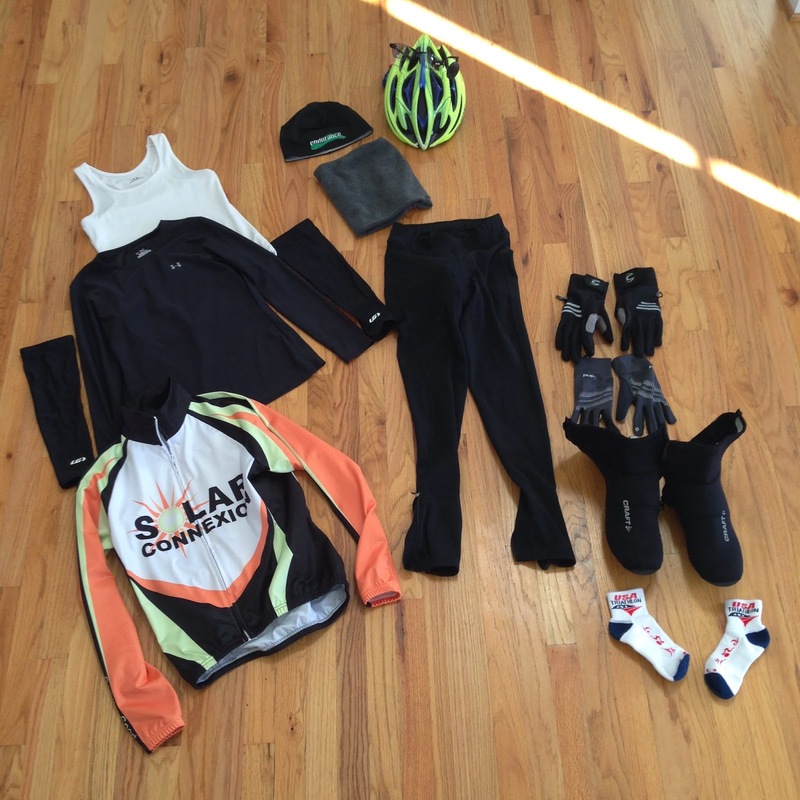 an iron-distance race just days before! It was nice to be among other PI enthusiasts! the parade of runners headed to the starting line! Post by Science Museum of Western Virginia. 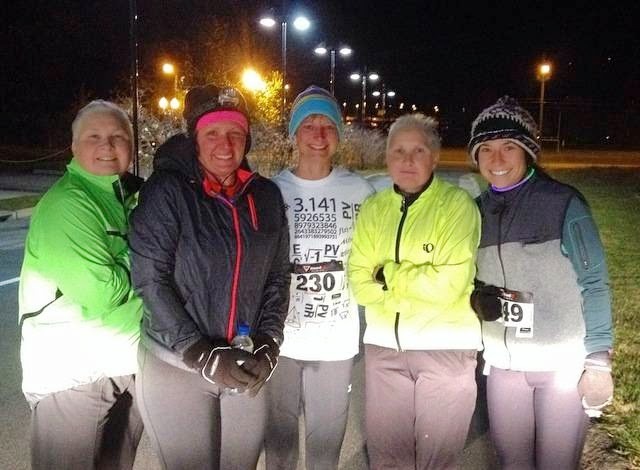 It was really neat to do this out-and-back race on the Roanoke Greenway, lit up only by our headlamps and flashlights! It offered a quietness and peacefulness that you only experience in the dark. I didn't plan to go real hard, but I fell into race auto-pilot and enjoyed hunting down and passing the only other female I could see ahead of me (the winner was WAY far ahead). The course was set up so that the turn-around point represented the edge of our solar system. Instead of mileage markers, there were signs letting us know which planetary orbit we were passing through! I kept wondering if they included Pluto or not, and I guessed not. I felt my watch signal the passing of the first mile, but never heard the second. I kept thinking that second mile felt awfully long! Then when the watch went off, and I thought I still had a mile+ to go, there was the finish! Happy me! In keeping with the Time Travel / Back to the Future theme, a DeLorian was supposed to be at the race, but ironically it broke down half a mile from the race, darn flux capacitor! It's OK, Dr. Emmett Brown made it there! He posed with 12-year-old Parker Albright and I. Parker was the overall female winner of the race, and I came in second to her, over 2 minutes back. Great job, Parker! The best reward was the hot chocolate at the end of the race, which I am fairly certain was the best I have ever had. And that's not just because I was freezing cold. They also had PI in the form of giant Benny Marconi's pizza. 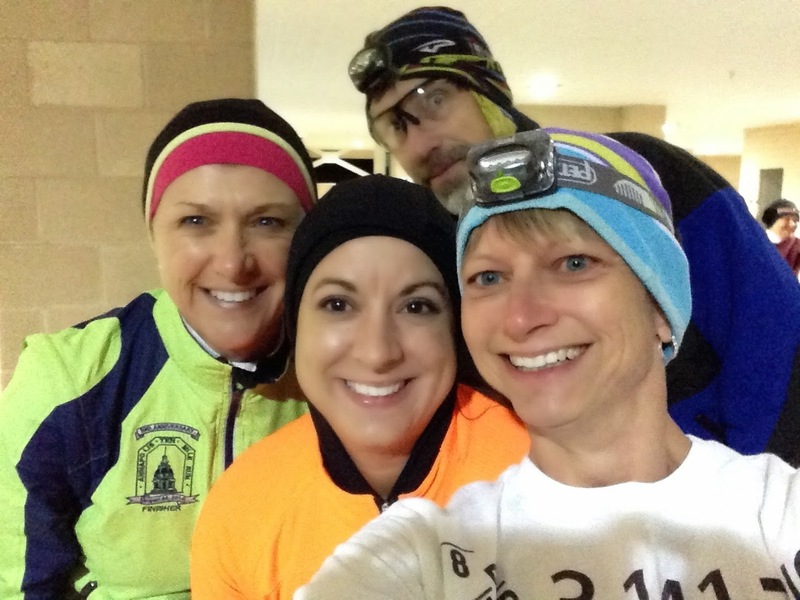 I would definitely recommend this race as just a quirky, fun, different thing to do! 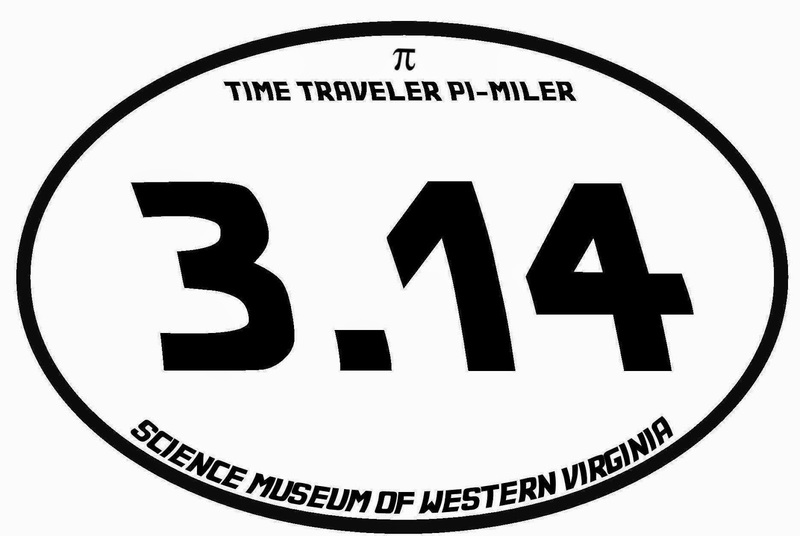 Great job, Science Museum of Western Virginia! !